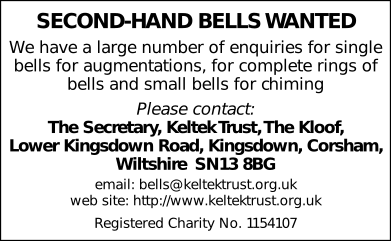 In memory of fellow bellringers Sheila Cobb of Publow and Mervyn Cox of Compton Dando who both passed away on Tuesday. Last updated Saturday, 29 April 2017 at 00:28:17. First submitted Friday, 28 April 2017 at 20:21:16 by Martin S Pearson. Sent for publication in The Ringing World on Sunday, 30 April 2017 at 21:34:32.